XOXO Jes - Canadian Entertainment News: What do Katie Holmes, Lauren Conrad, Denise Richards and Kate Winslet have in common? What do Katie Holmes, Lauren Conrad, Denise Richards and Kate Winslet have in common? 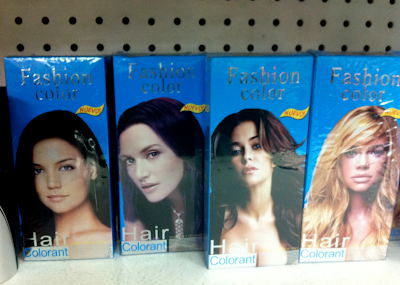 They have all been a target of this hilarious use of their faces illegally on these hair dye products that I saw today in the dollar store by my work. Clearly their faces have been photoshopped on to some other people's heads. If I was Denise Richards I would be pissed...the definitely put her with the worst head of hair of all of them. I think the biggest question here is...what kind of person buys hair dye from a dollar store? It's so ghetto I would be terrified of the results...would you even have any hair once you were finished?